Malini leads the technical activities of Clean Coalition’s Community Microgrid Initiative. She has helped communities across California, the New York metropolitan area, and Puerto Rico design and develop Community Microgrids through scoping, planning, and engineering design and analysis work. 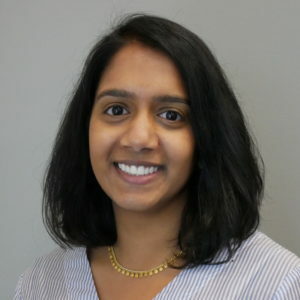 Previously, as a Research Engineer at the Schatz Energy Research Center, Malini tested and analyzed performance data from small-scale solar, battery, and LED consumer electronics as a consultant to the World Bank. She also helped scope, design, and build electric vehicle charging stations on California’s North Coast. Malini also has previous experience at Bloom Energy where she resolved design and quality issues with fuel cells. She received her BA in Environmental Engineering from the Department of Mechanical and Aerospace Engineering at University of California, San Diego. The Clean Coalition team is dedicated to accelerating the transition to renewable energy and a modern grid.